Besides some basic instructions for your traditional baked apple, Household Words lists recipes for apple cake, apple rice pudding, and “apple fool” (an apple custard). But apples à la princesse called my name. These apples are baked in a sherry bath (which sounds kind of like a royal treatment, or like being at a spa for lushes), then filled with a fruit jam and drizzled with sherry syrup. I like a little cinnamon with baked apples, so I made a spiced pear butter, rather than the apricot marmalade that Dickens Jr. suggests. 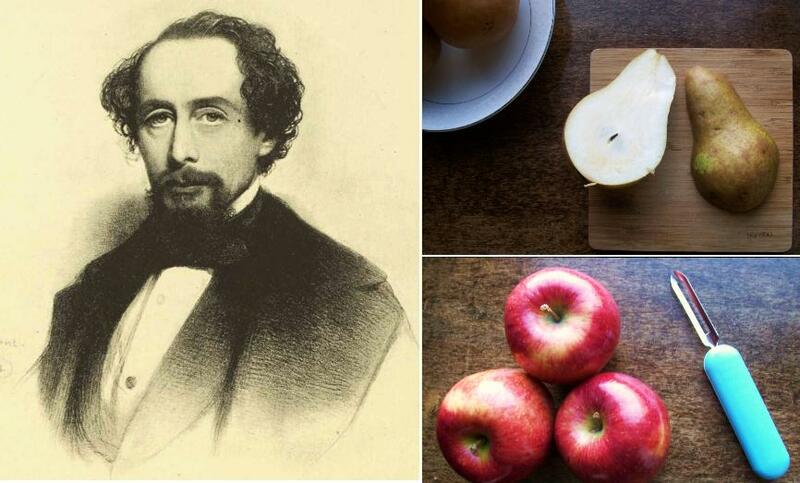 I don’t know if he would have approved of the substitution; he clearly thought pears were a lesser fruit, “most useful by way of change for children.” What can I say? I’m a kid at heart, at least if you judge by my produce preferences. 1. Combine pears and sugar in a large pot and stir to coat. Cook over medium heat until fruit is tender. Mash with a potato masher or the back of a fork until fairly smooth. 2. Add cinnamon, cloves, and lemon juice. Cook, stirring often, until the mixture has thickened and does not run when tested on a chilled plate, 1 to 2 hours. Remove from heat and eat within a week, or can whatever isn’t gobbled up. 1. Preheat oven to 325°F. Peel apples and remove cores with a scoop, leaving bottoms intact. 2. In a small saucepan, combine water and sugars, stirring until dissolved. Add sherry and lemon zest and cook another 3 minutes. Pour sherry mixture into a deep baking dish (I used a 9×5 loaf pan). 3. Add apples to the baking dish and cover with an oven-proof plate or aluminum foil. Bake until apples are tender, but not broken, about 1 hour. Transfer apples to plates or a serving tray and fill cavities with pear butter. 4. Boil remaining sherry liquid in a small saucepan until reduced by half, then let cool. Drizzle this syrup over apples, sprinkle with brown sugar and serve immediately. So gruel is just watery oatmeal? Or milky oatmeal – basically any cereal grain boiled in water/milk. Fun fact: malted milk is actually a form of gruel (malted barley in milk) and it is clearly delicious. I just discovered your blog and love the idea and concept of it very much. As a huge fan of Charles Dickens´novels, my eye got caught up on this post…..sounds delicious!